Here in this early statement Webb makes a case to the reader that environment shapes culture. It is a little heavy-handed, though. Of course environment influences culture, but Webb is fairly aggressive in that he said environment determines culture. This determinism, or determinism light, is an outlook that denies historical actors any type of choice, or that individual cause-and-effect. This also denies historical actors a humanist reality: while environment nudges individuals one way and another, individuals are faced with an infinite number of choices, and they still make one localized decision after another based off an infinite number of variables. 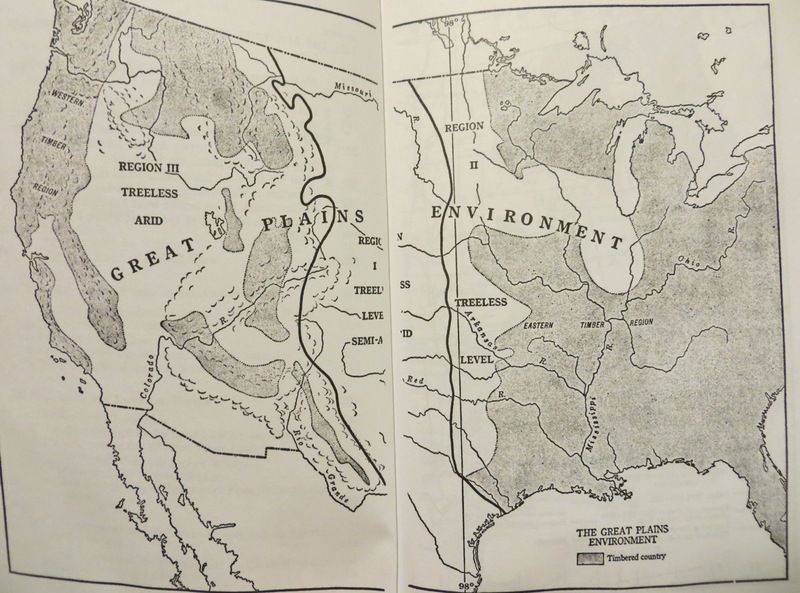 Continuing along this deterministic trajectory, Webb focused on a particular ethnicity, and said that “the Great Plains have bent and molded Anglo-American life, have destroyed traditions, and have influenced institutions in a most singular manner.” Again, Webb would do better to have said that the Great Plains induced historical actors to cobble together a variety of solutions if something did not work the first time around. Willa Cather indirectly points this out in infinite ways in My Ántonia (1918), and Ernest Staples Osgood showed how cattlemen formed stockmen’s associations to bring order to ranching in Wyoming, Montana and the Dakotas. Cultures are not destroyed, nor to they “rise” or “fall.” Humans tweak culture, and that culture slowly evolves over time, and turns into hybridized versions and variations. In any case, Webb alluded to Cather twice in his 525 page study, referring to her novels as “farm literature” full of “ugliness,” “drudgery,” and “tragedy.” (Webb, 1931: 478) In this, Webb reveals his nostalgic and romantic outlook toward the Anglo-American gun-slinging cowboy (who was not a famer), and this is what he is really concerned with: the rise and fall of cowboy culture. He said cattle kingdom literature is filled with “nothing of protest,” nothing of “destructive criticism,” and nothing of “dissatisfaction” — Webb provided basic amplification to the later delusions intrinsic to Spaghetti Westerns in American cinema. All of this is not said in a way that suggests Webb was conspiring to hide his fondness for the cowboy within his work. This simply means that when reading Webb, remember that he was a typical Texan of his times. His nostalgia for the past ought not to be taken any more or less seriously than anyone else’s nostalgia for the past. [i] One can understand his ideas without having to agree with them. Understanding how scholarship was framed throughout universities and publishing houses in the 1920s and 1930s might bring 21st century scholars to pause and contemplate what cultural baggage we bring to the evidence in otherwise “objective” studies of the past. [i] For an exegesis on the typical Texan, see Joseph Leach, The Typical Texan: Biography of an American Myth (Dallas, Texas: Southern Methodist University Press, 1952). This entry was posted on Monday, February 11th, 2013 at 7:21 pm	and tagged with Great Plains History, Walter Prescott Webb and posted in Uncategorized. You can follow any responses to this entry through the RSS 2.0 feed.